Emergency responders tend to a female shooting victim on Replin Road in Toronto on June 24, 2018. Toronto is calling on the provincial and federal governments for support as the city combats a rising wave of gang-fueled shootings. The death toll mounted Wednesday as another victim of a rash of weekend shootings died in hospital. Mayor John Tory says he wants to meet with Ontario Premier Doug Ford and federal Public Security Minister Ralph Goodale “as quickly as possible” to co-ordinate a response to gang-and-gun violence in Canada’s biggest city, wracked by 208 shootings so far this year − an increase of nearly a fifth from 2017. Mr. Tory, while saying Toronto remains a safe city, expressed “grave concern” about the mounting toll. “That’s all the reason why we have to redouble our efforts to get these gangsters, round them up, get them off the street,” Mr. Tory said, noting that the police force is hiring 200 new police officers by the end of the year. The mayor said he will press the province to tighten bail guidelines for some people arrested with firearms, and ask Ottawa to quickly disburse to Toronto its share of $328-million in promised anti-gang funding. At least 10 people have been shot in Toronto in the past five days – a wave that Mr. Tory and Toronto Police Chief Mark Saunders have said is “90 per cent” gang-related. In a radio interview on Tuesday, Mr. Tory clarified that he is not referring to the victims, but the people pulling the trigger. Toronto Police spokesperson Mark Pugash confirmed Wednesday that one of the victims in the Kensington Market shooting on Monday has died. He would not provide any information about the victim’s identity, or the condition of the other victims. Around 8 p.m. on Saturday, three people were shot in the downtown entertainment district. 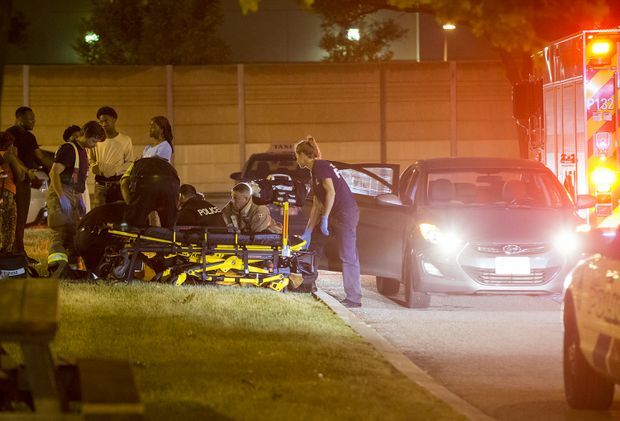 Two men – Jahvante Smart, 21, a rapper also known as Smoke Dawg, and Ernest Modekwe, 28, both from Toronto – were killed. On Sunday, around 10:30 p.m., shots rang out in the Kensington Market area. Four people were injured and taken to hospital. On Tuesday, a man was shot at King and Portland Streets at about 2:45 a.m.
Mr. Tory said he and Chief Saunders have discussed some short term actions, such as more security cameras, more resources and accelerating reforms to divert non-emergency calls away from uniformed police. Mike McCormack, president of the Toronto Police Association, said under-staffing is a challenge for police in responding to shooting calls and gang violence generally. He also said reforms of police stops known as street checks or “carding” – a practice found to disproportionately target people of colour but that many officers said was an important intelligence-gathering tool – have forced police to be “reactive” rather than pro-active. Peel Region Police Chief Jennifer Evans has also blamed the end of street checks for the rise in violence. Mr. Tory said on Tuesday that any notion that a simple solution can be found to gun violence is wrong. Mr. Tory said his office is doing an inventory of all programs funded by all three governments aimed at curtailing gang violence or helping at-risk youth, to see if funding ran out for any successful programs. Often, such programs are funded for only three or four years. He told reporters the federal government had recently allocated hundreds of millions of dollars to fight gang activity, but that the province and the city must apply for the funding. Last November, Mr. Goodale announced $328-million in new funding over five years as part of efforts to reduce gun crime across Canada. He said the government is still working out how the funds will be distributed. “Obviously, when people do not feel safe, when they feel that random attacks can take lives and cause serious injuries to innocent people just walking down the street and minding their own business, obviously that’s a deep concern,” Mr. Goodale said in a radio interview on Tuesday. Both Mr. Tory and Chief Saunders suggest offenders are being released on bail too quickly, and are cycling back into the same criminal networks. Mr. Tory told reporters that among the reforms, he and police hope the province will pursue is stricter guidelines that would instruct Crown attorneys to argue against bail for anyone already out on bail and caught with a gun, and for anyone previously convicted of a gun crime. Mr. Tory has said police have complained that suspects in gun crimes are soon back on the street.